With five distinct amp “characters” to choose from, support for acoustic-electric guitars, and access to a wide range of customizable effects, the BOSS Katana 50 combo amplifier represents a new generation of flexible amplifiers for practice and performance. A set of familiar controls allow for fast tone shaping, and you can use the BOSS Tone Studio editor software to further customize your amp settings and effects. The Katana 50 is also equipped with a tilt-back stand so you can hear the amp better, and an adjustable Power Control that allows you to achieve cranked-amp tone at lower volume levels. 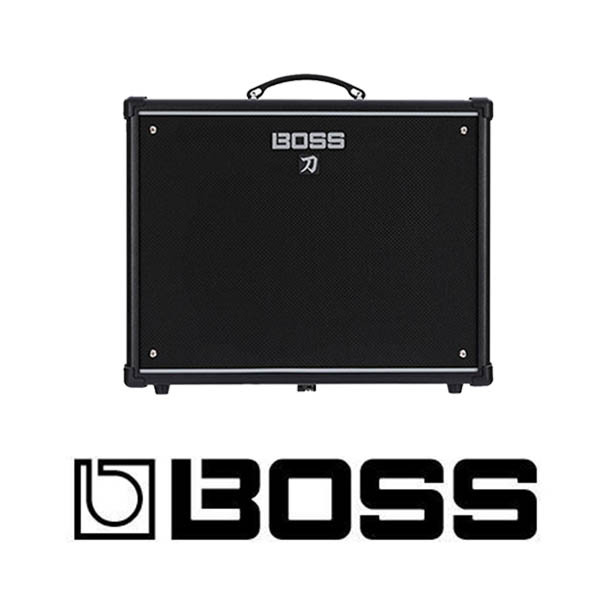 For a does it all amplifier for electric and acoustic-electric guitar, you definitely need to check out the BOSS Katana 50 combo amp. The BOSS Katana 50 combo packs five distinct amp voicings. Clean, Crunch and Lead cover the range from chiming clean tones and gritty rhythm tones to solo-worthy high-gain leads. As an added bonus, the Brown setting is derived from the BOSS Waza amplifier – think iconic ’80s metal. And finally, the Acoustic mode allows you to plug-in your acoustic-electric guitar too. No matter what style of music you play, or even what kind of guitar you play, there’s a world of tone to explore in the BOSS Katana 50 combo amp. The Katana 50 supports 55 sweet BOSS effects, and you can load up to 15 of them for instant access. The amp’s Booster/Mod, Delay/FX, and Reverb controls give you easy one-knob access to each effects type, with a color-coded button to switch between preset effects. To completely customize your effects and amp settings, connect the Katana 50 to your computer via USB and load up the Tone Studio software. Create your own setup, or download setups created by pro guitarists at the BOSS Tone Central website. Best of all, the Katana 50 can store two custom amp and effects setups for instant recall, effectively making the Katana 50 a versatile two-channel amplifier.